Because of no GUI the installation of VMware Tools is a little bit difficult. But VMware Tools brings a lot of drivers and functions, which makes working with the vm much easier. 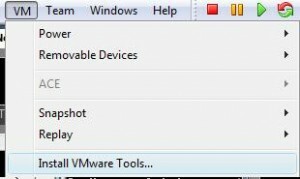 To start the installation choose Guest/VM > “Install VMware Tools”. This command starts the installation without GUI and automatically reboots the server after installation ends. After the reboot all functions of VMware Tools are available.